The Crustacea are a subphylum of the animal phylum Arthropoda. This is a large and diverse group with more than forty thousand species, including crabs, shrimp, lobsters, crayfish, barnacles, and many near-microscopic members of the zooplankton community. The subphylum is characterized especially by having mandibles and compound eyes and living in mostly aquatic habitats, although the "pillbugs" found under rocks and boards are also crustaceans, and many crabs spend much of their time on land. A horseshoe crab on Fire Island National Seashore, New York. The Crustacea are a large and diverse group with more than forty thousand species. calcium carbonate. The edible blue crab, for example, has as much calcium carbonate in its exoskeleton as four sticks of chalk. The rigid exoskeleton requires crustaceans to molt, or shed it periodically, in order to grow. Some crustaceans can mate only during the brief time just after they have molted and the new exoskeleton is still soft. This is also a time of great vulnerability to predators, so crustaceans often seek a place to hide before molting. Some crustaceans resemble miniature adults from the moment they hatch, but many species have larval forms with little or no resemblance to the adult. These larvae, and some adult crustaceans, such as krill and cope-pods, are very important members of the freshwater and oceanic plankton community and are a major source of food for corals, fish, baleen whales, and other animals. A few crustaceans turn the tables on these predators by parasitizing the skin of fishes. These parasitic crustaceans are often wormlike and scarcely recognizable as relatives of shrimp and crabs. Ruppert, Edward E., and Robert D. Barnes. Invertebrate Zoology, 6th ed. Fort Worth, TX: Saunders College Publishing, 1994. 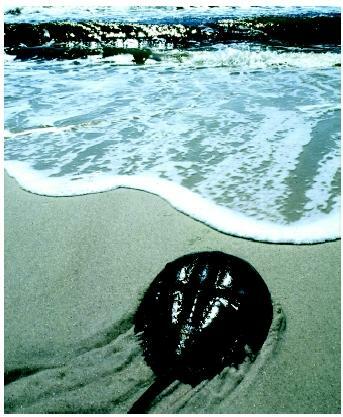 To avoid ambiguity, I think you should choose another illustration for this article: horseshoe crab isn't a crustacean at all. Moreover, many recent studies has revealed that hexapods (including insects) must be classed among other crustacean. I think it would be interesting to to say it too. See Regier et al 2010 - Arthropod relationships revealed by phylogenomic analysis of nuclear protein-coding sequences. Nature 463, 1079-1083.